When customers know that they can communicate directly with a business on social media, they may connect with them for any number of reasons. But as soon as they realize that a customer service issue or product question can be addressed via a single Tweet or post, they’re more likely to do business with the businesses that respond online. A recent infographic from Zendesk, shown in the figure, shows some remarkable numbers. A surprising 62 percent of consumers have used social media for support. As more people discover and participate in social media, they realize how easy it is to use this new medium for customer service. Savvy business owners who monitor Twitter or Facebook can have texts sent to their smartphone when a customer mentions their business — and can respond immediately on the spot. We’re all talking about this like it’s optional. It’s not. If you’re a financial adviser and you meet a Gen Y guy at a party, a 30-year-old who’s making some real money, and he goes to look you up on Google and doesn’t find you, to him you don’t exist. This is not optional. It doesn’t mean you have to be Tweeting all day and spending all your time on Facebook. That’s not necessary. But you should have a beachhead somewhere, and you should have some social clout. You should have people following you and conversing with you. You should have some stuff out there that seems like you’re engaged, because otherwise you’ll come off like you’re asleep. In April 2012, Maritz Research asked questions of an online panel of U.S. Internet users about their awareness and use of several consumer feedback mechanisms. The table shows some interesting data from the 1,400 respondents. From the numbers in table, you might think that social media was a lagging technology in business communication. But consider that e-mail first gained popularity through CompuServe in 1992. Social media has been recognized only since MySpace transitioned from a file storage service to a social networking site in 2004. Facebook opened its doors to the public in late 2006, and Twitter became its own company in 2007. The 2012 American Express Global Customer Service Barometer found that consumers who have used social media for service wield the greatest amount of influence. They tell significantly more people about their service experiences, and say they’d spend 21 percent more with companies who deliver great service — compared to 13 percent on average. Consumers who have used social media for service in the last year are willing to pay a 21% premium at companies that provide great service. They also tell three times as many people about positive service experiences compared to the general population. Ultimately, getting service right with these social media savvy consumers can help a business grow. Here’s a table designed by eMarketer.com based on the American Express data. It graphically demonstrates why Internet users are flocking to social media for customer service. 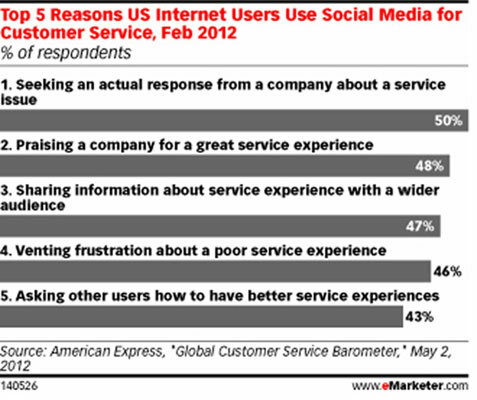 Top five reasons why U.S. Internet users use social media for customer service. A telling piece of information has been repeated twice. If those who use social media for customer service are willing to pay more for your product or service, you ought to get something going online in a hurry. Use your online posts as a way to inform a large group of people at once. Your transparency in public is respected. When you admit to a mistake in front of an online community, making it right on the public network reflects well on you and your business. This table provides some additional information from the study about the power of social media customer service that is worth considering.